AirPlay: Through the AirPlay feature, you can wirelessly stream movies — commercial flicks or videos you shot — as well as photos and music from the iPad mini to an Apple TV box that’s connected to an HDTV. 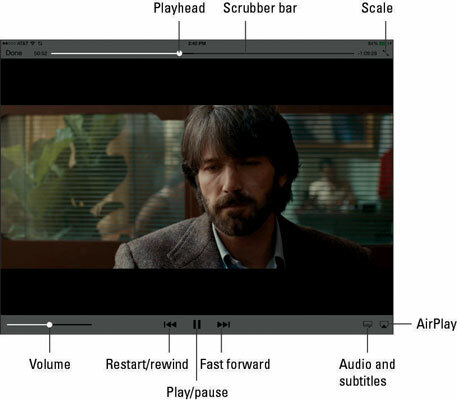 Start watching the movie on the iPad mini and tap the AirPlay button that appears in the video controls. You can watch only one screen at a time. Tap Apple TV to stream to the TV through the Apple TV box. Tap iPad (or whatever device name has been set) to watch on the iPad. You can multitask while streaming a video. Therefore, while the kids are watching a flick on the TV, you can surf the web or catch up on e-mail. Although you can stream from an iPad mini to an Apple TV and switch screens between the two, you can’t stream a rented movie that you start watching on Apple TV to the iPad mini. AV Adapter cables: Apple sells Lightning-to-Digital AV (HDMI) and Lightning-to-VGA adapters at $49 each for use with the iPad minis (as well as fourth-generation iPads and beyond). With a mini, the Digital AV (HDMI) adaptor also lets you mirror the iPad screen on the connected TV or projector. So not only can you watch a movie or video, but you can also view anything else that’s on the iPad’s screen: your Home screens, web pages, games, other apps, you name it.